Wolf Spider (also known as Wilczy Pajak; the Polish translation of their name) is Polish thrash metal band formed in the mid-1980's. "Drifting in the Sullen Sea" is the band's third album. I actually owned this album for months before finally adding it to this website, not because I didn't like it. In fact, I've played it many, many times over and enjoyed it. However, I just wasn't exactly sure what to say about it and I'm not sure I can truly explain it in words. The music is technical and progressive thrash metal that is really unlike most any other thrash band that I can think of, yet they are very clearly a thrash metal band. The opening track is one of the more straight-forward thrashers on the album. Likewise, "King of the Animals" is another more straight-forward thrasher. However, even these songs are quite technical stitched together with machine gun riffs, furious drumming and manic, slightly gruff vocals. Other tracks such as the title track and "Orphanage" are slightly more experimental, though never really straying far from thrash metal. Despite being technical and heavy, the band also incorporates plenty of melody. The proper album ends with a cover of Queen's "Mustapha." 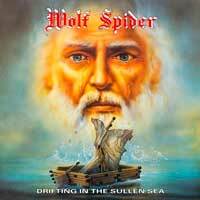 "Drifting in the Sullen Sea" is a unique thrash metal album from a band relatively unknown outside of Poland. As usual Metal Mind does a fantastic job with the re-issue. The gold CD is wrapped in a four panel digi and includes a booklet with lyrics, photos and a short bio. The reissue also contains four bonus demo tracks. The CD pressing was limited to 2000 copies world wide and was digitally remastered using a 24-Bit process.